The day has finally arrived! Close to two years of development by a dozen team members past and present, developing a staggering 75,000 lines of code to form quite possibly the biggest ever World of Warcraft addon project, in terms of scope and functionality. We are incredibly proud and thrilled to say, TradeSkillMaster 4 has officially launched. If you’ve been participating in the beta program, you’ll receive a final update through the TSM Desktop application containing the public release version of the addon. As a Premium subscriber, your application will also handle updating to the release version and any other updates released in the future. After the beta program finishes, downloading TSM4 and keeping it up to date will be possible through Twitch or Curseforge, depending on your preferences. For those of you who haven’t been following the beta, we wanted to share some overviews on what to expect in the new version of TSM – along with some top new features. One of the main priorities for the new version of TradeSkillMaster is to make it much more accessible to new users. In order to do this we have first of all merged all of the TSM modules in to one core addon, this means you no longer have to separately keep track of multiple addons and their different versions. You now only need two addons, the main TradeSkillMaster addon and the TSM AppHelper addon to bring in your pricing information is all you need to get up and running!. Once TSM is installed, you’ll notice it has been completely redesigned and rebuilt from the ground up. The new UI design was made with ease-of-use in mind, surfacing frequently used features or tools within the addon. Under-the-hood too, our code-base rebuild has led to more efficient loading times and performance when scanning, collecting mail or handling inventory. We discussed the philosophy behind the redesign in a previous blog post. Not forgetting experienced goblins and gold-makers, our intent with TSM4 was to provide the opportunity to take a veteran or power user to the next level by introducing powerful new logic functions and exposing more data as sources to be referenced in operations. ifgt() – “If Greater Than” or iflte() – “If Less Than or Equal To” and the new round() function for standard rounding. In addition, being able to reference more data points in your operations allows for incredible granularity. With this in mind, and based on lots of feedback over the years, we have introduced the likes of DBRegionSaleRate, NumExpires, ItemLevel, and DBRegionSoldPerDay as sources that can be called in your operations. You can read more about this in our Deep Dive blog post. 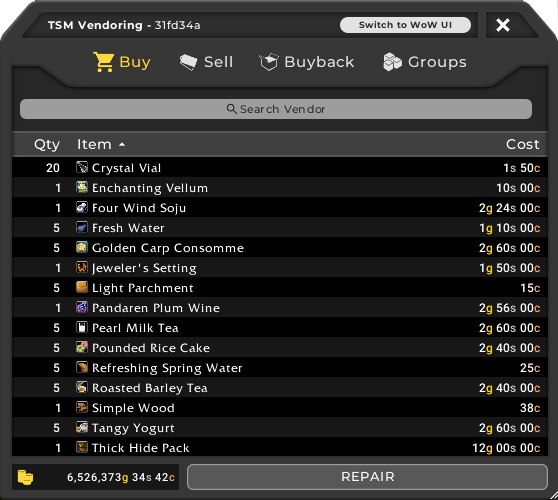 Taking a look inside the addon itself now, the main TSM window has received a major overhaul. The new Group Tree is now headed by the all-encompassing Base Group. The Base Group essentially handles all items that are not in a group and comes with some basic ‘default’ operations out-of-the-box. This means you can now install TSM4 as a brand new user and get started with posting items from your inventory, crafting things from your profession and sniping cheap deals off the Auction House. The Group Tree also allows for incredibly easy organization since we’ve added drag-and-drop group management. 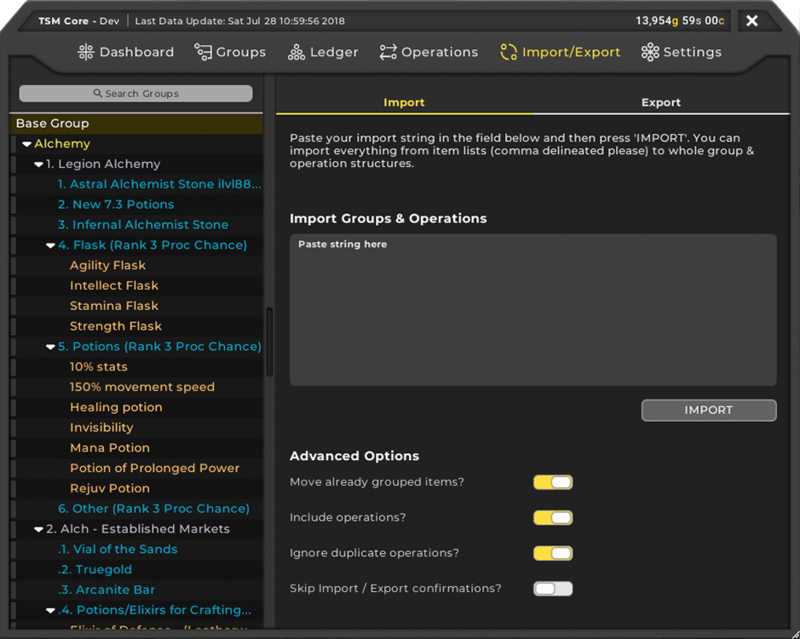 Importing and Exporting TradeSkillMaster settings has also been supercharged, with the addition of options to include custom prices and skip previously imported operations. 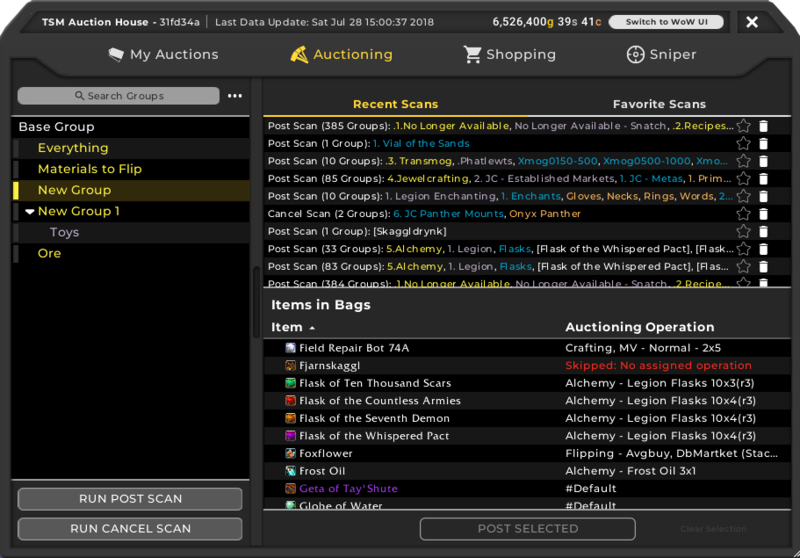 Posting items on the Auction House is usually a key way to make gold, so ensuring the Auctioning module of TradeSkillMaster is the best it can be was a big priority as part of the rebuild. The Quick Post From Bags function has evolved as part of the Base Group, you can now select individual items to ‘quick post’ or run a full post scan against your Base Group with the default Auctioning operation. 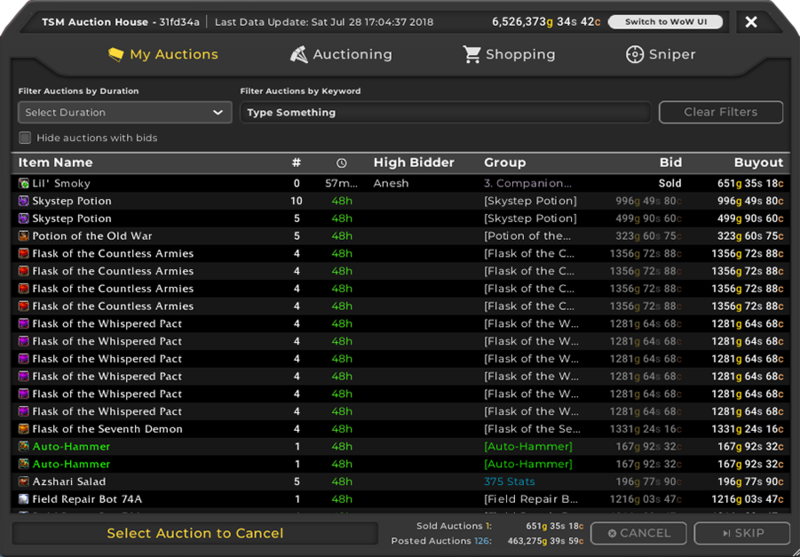 On the back-end, efficiency improvements were made and running auctioning or cancel scans are much quicker in TSM4. Once you’ve posted your auctions, you need a place to review what is posted and check for incoming sales. 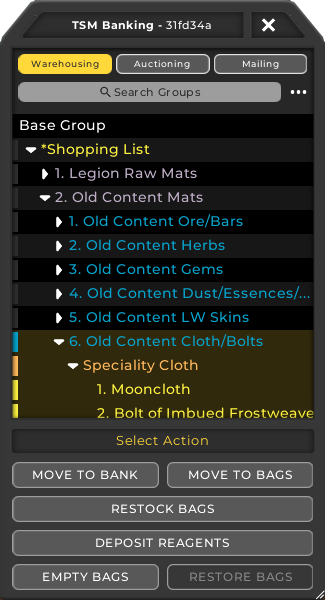 With the release of TSM4 we have introduced a new view in the addon called My Auctions which replaces the default Blizzard UI ‘Auctions’ tab. This lists your current auctions, sales and notes which group they’re in and how long is remaining on the auction. Within this interface, you can also filter your auctions by duration and item name – then cancel everything without checking for undercuts. 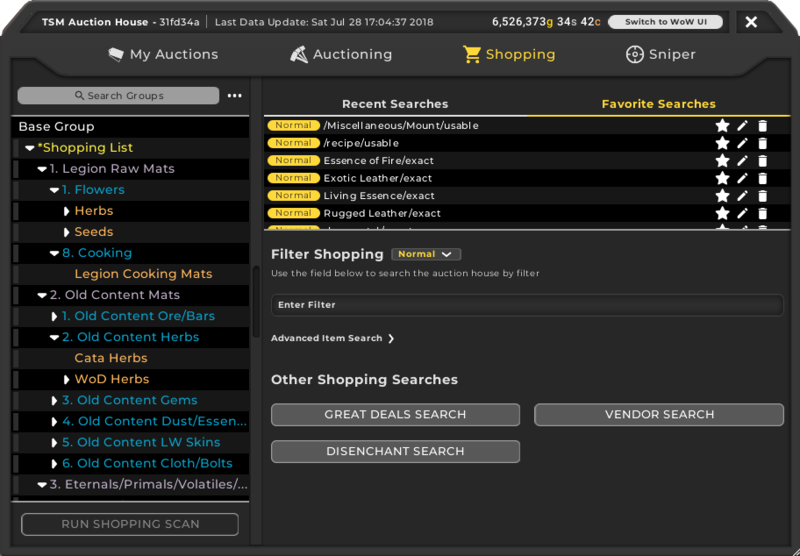 Many improvements have been made to TSM Shopping, including faster scanning just like Auctioning. The recent and favorite search section has been built upon, allowing you to save frequent searches and rename them for easier access. Shopping scans are also much more efficient, as with other forms of scanning. Sniper was formerly part of the TSM Shopping module, however this tool has now been separated out in to its own first class feature. We’ve created a new type of operation for Sniper to allow extra granularity, applying the maximum Sniper price to a specific group of items – rather than a generic one-size-fits-all Sniper function, as it was in TSM3. 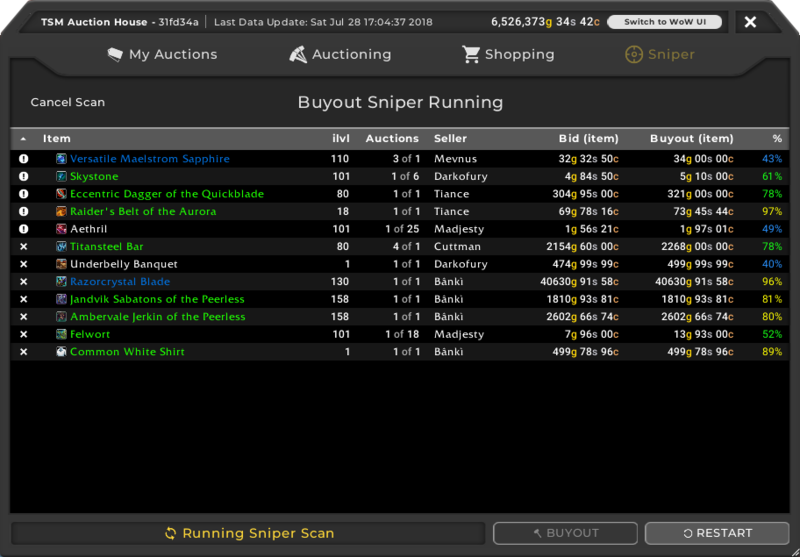 In addition, we’ve also developed a Bid Sniper, allowing you to snipe auctions that are about to expire from the Auction House. Sniper will now also highlight new results by lifting them to the top of the list, plus offers to remove an item from the list that you don’t want to see. 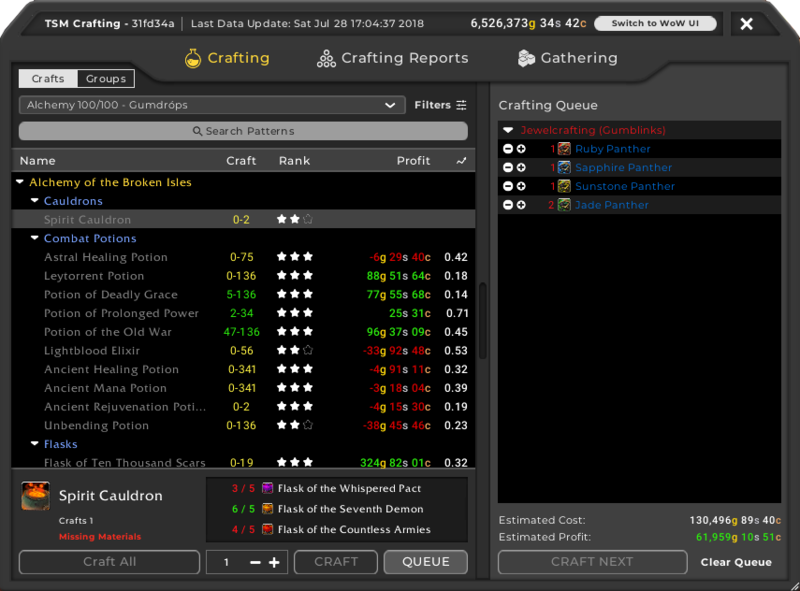 The TradeSkillMaster profession interface has been completely rebuilt, allowing much easier access to the information you need in order to make decisions on what to craft. 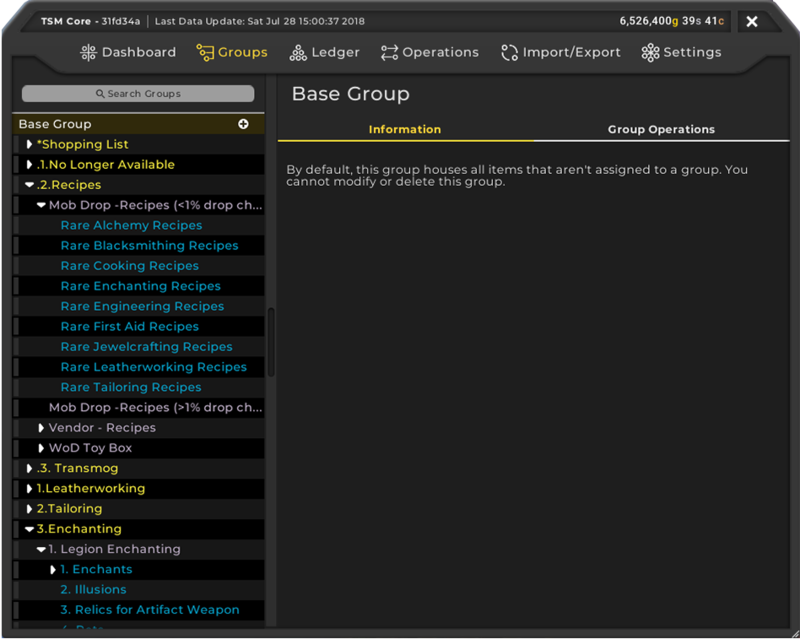 At-a-glance data like profit, region sale rate and recipe rank are all included in the main profession window. 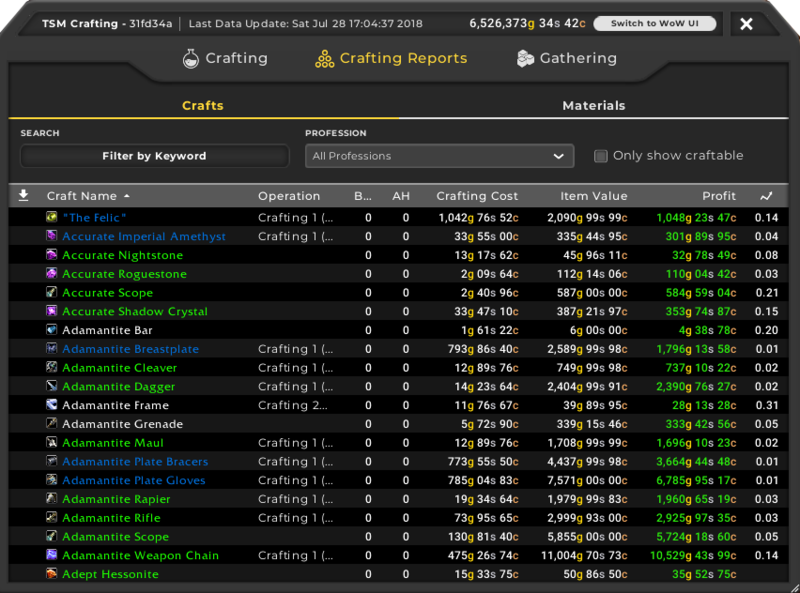 You can also access a list of everything you can craft across all of your characters in the Crafting Reports, with contextual information like which operation is assigned, item value and profit along with an option to click-to-queue. Adding custom values or prices to your materials is also managed in this menu. Gathering leveled up in TSM4 too, with the new Gathering priority system. You can tell TSM in which order to prioritize sources to collect: from including buying from the Auction House, your alts, your guild banks, crafting it when it’s profitable (or not) and purchasing from a vendor. 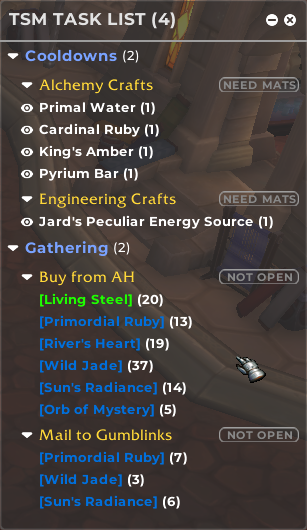 The Gather window also has a list of materials set to be gathered and notes what you have and what you still need from each source. This is a new feature in TSM4, and is quite possibly the most exciting foundational tool to build upon in the future of TradeSkillMaster. Upon initial release, the new Task List will handle all of your daily cooldowns and gathering for your crafting queue as discussed in the previous section. You can remove cooldowns you’re not interested in, and use the prompts to logout of a character, move items from your bank, send materials to a crafter or buy items from the Auction House or a vendor. 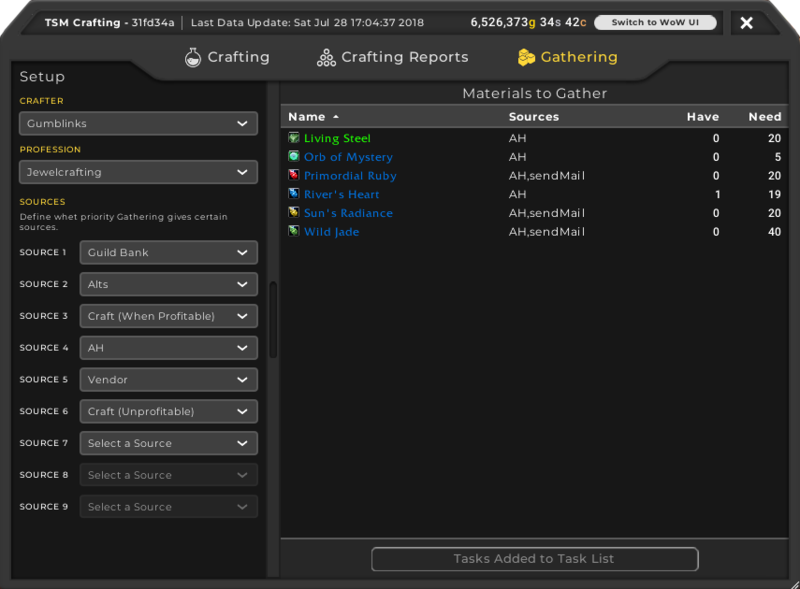 In the future, the Task List will potentially be the driving component of nearly everything you do with TradeSkillMaster – offering prompts based on other operations like Auctioning or Crafting, or tracking custom tasks like a farming objective. These TradeSkillMaster modules have received the TSM4 treatment, with a new UI design and under-the-hood improvements. Collecting mail, and moving items are much faster in TSM4, plus each module functions on the new and powerful Group Tree structure that underpins the TSM4 addon suite. 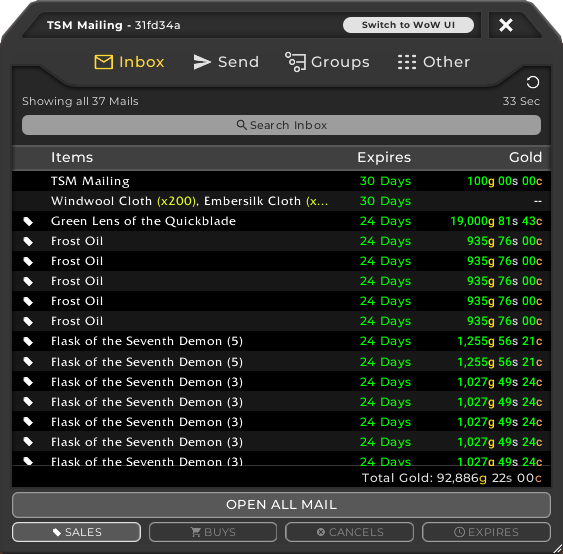 TSM Mailing now also allows quick sending to alts, friends and guild-mates, plus drag-and-drop or right-click to add items to send in individual mail for the first time in TSM. 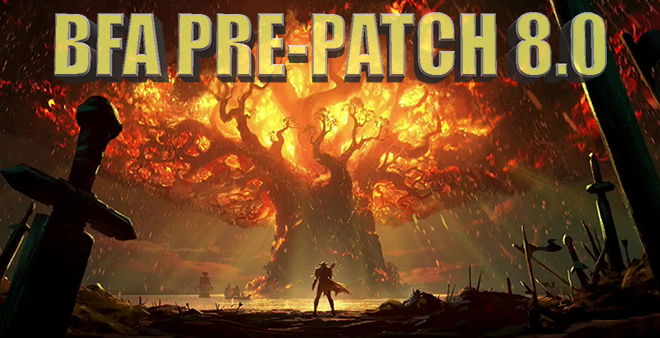 The Battle for Azeroth pre-patch is upon us, and the countdown to the expansion launch marches ever-forward! Updates for TradeSkillMaster 3 have been prepared for the 8.0 pre-patch and should be available now through your Twitch app, or directly through the TSM application if you’re a Premium member. 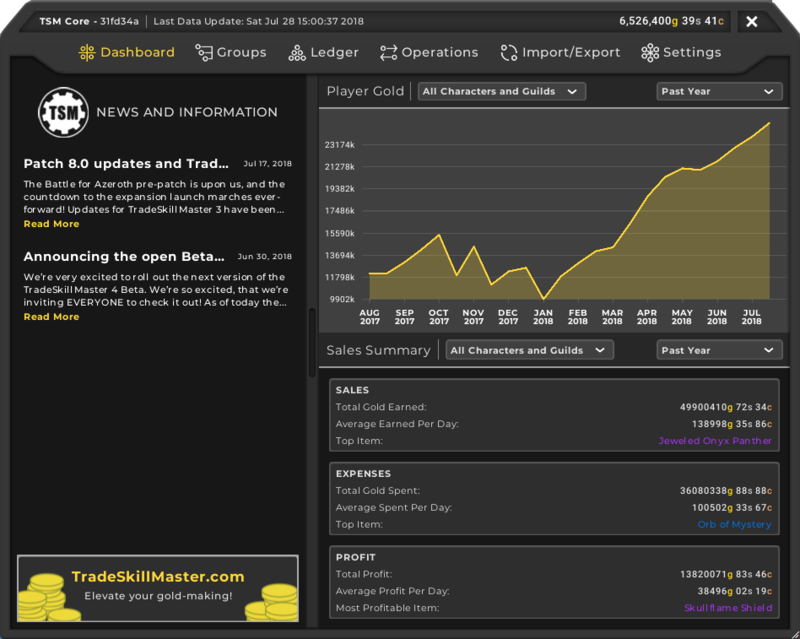 At the same time, we’re pleased to share more information on the status of TradeSkillMaster 4. Open Beta saw participation increase dramatically as the excitement builds for the official release, with so many of you signing up, this was a bigger beta test than TSM2 and TSM3 combined! The addon suite is now feature-complete, with some aspects being foundations to build upon, so polishing and bug squashing is the final priority for the development team as we prepare to release TradeSkillMaster 4 on July 28th 2018. Expect more addon updates as the beta testing period draws to a close, and keep an eye out for updated release notes in the #beta channel on our Discord server. The most recent updates can be viewed on our changelog, with various knob tweaking and dial twisting across the board. You can also continue sharing your feedback with us, while any error messages you receive in-game will still be reported back for investigation automatically when you fill in the steps leading up to the error. 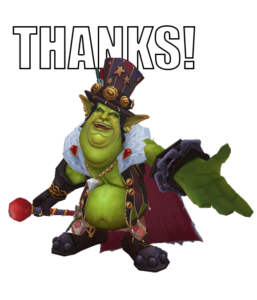 As always, big thanks to all of our intrepid beta-testers out there as well as the amazing WoW gold making community!